The ideal hire for the scummy North Carolina football program would be the guy from scummy Miami. 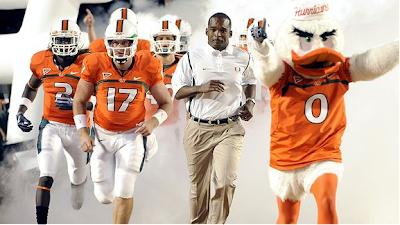 North Carolina should replace Butch Davis with Randy Shannon. That's something I first thought months ago, well before North Carolina found the backbone to get rid of Davis, and that thought hasn't been shaken by the sleaze that Yahoo found under 70-plus rocks in Coral Gables. Actually, that thought has been strengthened by the UM scandal, because there was one guy at Miami -- and only one guy -- who sniffed out Nevin Shapiro as the jock-sniffing piece of scum that he is. And that person was Randy Shannon. Shannon also is the same person who replaced a long line of impotent Miami coaches -- one of them being Butch Davis, come to think of it -- and put his, um, foot down and said, "No more." No more arrests. No more academic embarrassments. No more of the stuff that had been going on since Jimmy Johnson begat Dennis Erickson begat Butch Davis begat Larry Coker. And you know what? There was no more. Well, almost no more. In his four years as head coach at Miami, one player was arrested. One! Contrast that to what was happening up the road in Gainesville, a city with fewer temptations than Miami, where the Florida Gators endured 25 or 30 arrests -- accounts vary because there were so damn many players arrested under Urban Meyer -- in the same time period. At Miami, Shannon also had the third-highest lifetime APR among active coaches in Division I-A. The only coaches ahead of him were at Navy and Air Force. Not at Duke or Vanderbilt or Stanford, by the way. Only two service academies. That was Miami's academic company under Randy Shannon. But he won only 28 games in four years, so Miami fired him. Before that could happen, though, Shannon saw through Nevin Shapiro -- the same guy you've seen smiling in this photograph with the Miami president, Donna Shalala, who is such an astute judge of character that she ran off Randy Shannon but embraced Nevin Shapiro. Shannon didn't embrace Shapiro -- he loathed him. He told his players multiple times to stay away from that snake, and he told his coaches he would fire them if they associated with Shapiro. That's how clean Randy Shannon is as a football coach -- and North Carolina needs somebody spotless. North Carolina football is very much like Oklahoma basketball after the Sooners were dragged into the swamp by Kelvin Sampson, then held there by a staff member under Jeff Capel. Oklahoma needed the cleanest coach it could find, and it found him in Lon Kruger. The guy doesn't have a Hall of Fame résumé, but Kruger wins a lot more than he loses, and he's so clean that he squeaks when he walks. Oklahoma needed a guy like that to restore public confidence in its program, and Oklahoma got him. Now it's North Carolina's turn, but I'm not confident the Tar Heels understand what they need. Lord knows they didn't know it was time to get rid of Butch Davis when it was clearly time to get rid of Butch Davis -- a year ago, when the NCAA was investigating separate scandals, when nearly 20 percent of the team was suspended and when Davis' close friend and recruiting coordinator, John Blake, was being exposed as a longtime runner for an agent. North Carolina needs Randy Shannon, but North Carolina was the last to know it didn't need Butch Davis. Then again, a different athletic director will be making this hire at UNC, so there is hope. Also, the list of realistic candidates for the job won't be impressive, given the NCAA sanctions sure to be facing the Tar Heels. There will be some ambitious head coaches at smaller schools willing to do anything to get into a BCS conference. There will be veteran assistants at big-time football schools who've never been able to land a BCS head-coaching gig. And there will be the guy who went to three bowls in four years at Miami, graduated his players, kept them out of arrest reports and was the only person on campus who tried to steer the UM football team away from Nevin Shapiro. If North Carolina can do better than Randy Shannon, do it. But I'm telling you, it can't. North Carolina needs the cleanest good coach it can find -- and Randy Shannon emerged from the muddy mosh pit at Miami without a grain of sand on him. 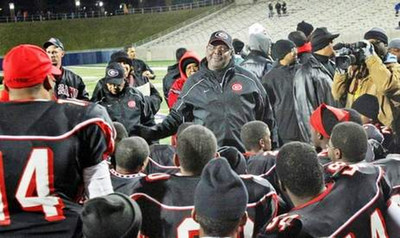 Glenville coach Ted Ginn Sr. talks to his team. Ginn's rolling showcase helped make his team the top Big Ten recruiting factory since 2002. The best high school football factory in the Big Ten started when a security guard rented a seven-passenger van. A decade later, Glenville Academic Campus in Cleveland is the most important place on every recruiting map. You want to build a Big Ten dynasty? You'd better start here. He has sent 31 players to Big Ten schools over the past decade. No other school in the country has produced more than 12. Ginn's mother moved him from New Orleans to Cleveland when he was 11. He played for Glenville in an era when Glenville didn't win anything. Two years after he graduated, his mother died. The head coach made Ginn volunteer on the football staff “so I wouldn't go astray.” In '97, Ginn took over the program. School security guard by day, head football coach by night. Soon he established a bold plan to draw attention to his players. Instead of waiting for college coaches to call him, Ginn took his players on the road. He packed them in a van and spent most of the summer ushering them to college camps. Sometimes seven or eight slept in the van. Sometimes they piled into one hotel room. The next morning, they showed up at a campus, spent an hour or two running through drills, then hit the road for the next stop. They drove as far as LSU. Ginn recalls telling college head coaches like Nick Saban that he had five kids in his van who could run a 4.3-second 40-yard dash. “Everybody used to laugh at me,” Ginn Sr. said. Until they observed the talent in the van. Pierre Woods was the first Glenville player to take advantage of Ginn's recruiting showcase on wheels. In 2001, he signed with Michigan. Why limit the journey to seven passengers, Ginn decided. He got a bus. Picked up kids all over Cleveland. Why limit it to Cleveland, Ginn decided. He picked up kids all over the state. Columbus. Dayton. Toledo. “When you're driving around and putting on a show like that, word is going to travel,” Ginn said. Now Ginn's teams regularly compete for state championships. Now the Glenville Tarblooders attract players from all over the city. “It's kind of the all-stars of Cleveland,” said Bill Conley, a former Buckeyes assistant. Ginn, who knows Bo Pelini, recalls days when eight or nine Big Ten coaches came to Glenville. The most frequent visitor: Ohio State. Of the 31 Glenville players who signed with Big Ten schools the past decade, 17 landed at Ohio State. Pretty good players, too. Troy Smith, Heisman Trophy winner. First-round draft picks Donte Whitner and Ted Ginn Jr. In February, the Glenville pipeline continued. One player signed with Indiana, one with Michigan, one with Ohio State. Ted Ginn Sr. doesn't need a van or a bus. Now the recruiters come to him. Labels: NC Sports Clients Give Back, ted ginn sr.
Giants fans may be worried about the strength of their offense after the losses of wide receiver Steve Smith and tight end Kevin Boss, plus a lackluster effort in the team's preseason opener. But a closer look at the numbers should provide some reassurance. Big Blue's key remaining skill players have résumés that would make them the envy of most of their peers. Quarterback Eli Manning last year became just the 30th quarterback since the 1970 merger to post a 30-plus touchdown pass season. 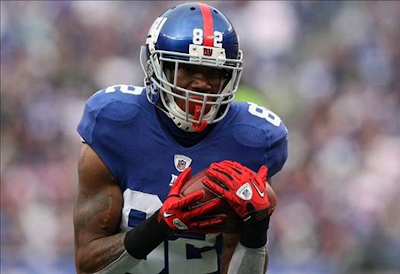 His primary target, wideout Hakeem Nicks, has 17 scoring grabs in his first two seasons, the 11th most since 1970. 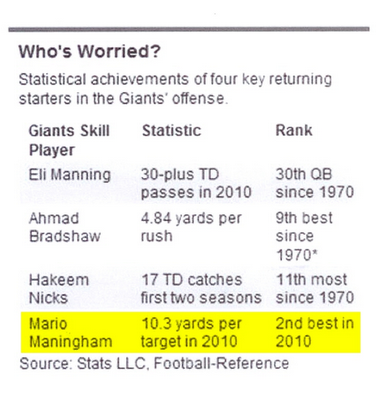 Smith's replacement at wide receiver, Mario Manningham, was the second-most effective weapon in the league last year measured by average gain on all passes thrown his way (completions plus incompletions). 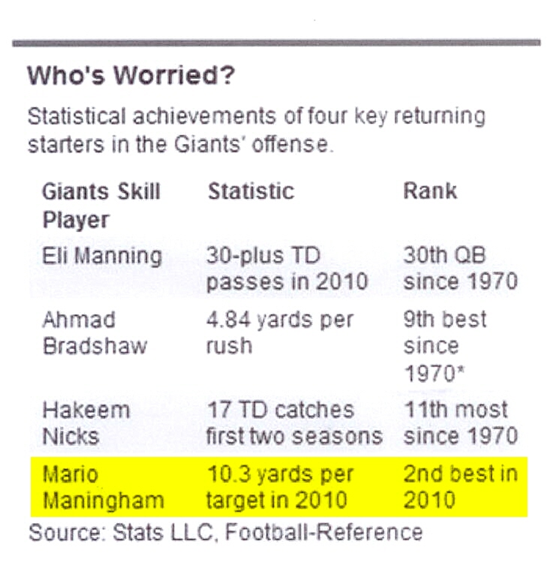 Should the opposing defense overplay these elite wideouts, Manning can just turn around and hand the ball off to Ahmad Bradshaw, whose 4.84 yards per carry is ninth best since 1970 among all running backs with at least 500 attempts . Pessimists will argue that the Giants finished just fifth in yards gained and seventh in points scored even with these four playing at high levels. But that was largely due to the team's league-high turnover rate. Most notably, Manning threw 25 interceptions, but there's an argument that this was the result of bad luck, considering eight of these picks first hit the hands of his intended receiver. If Smith and Boss returned, it may have turned out to be subtraction by addition. After all, Manning only has one ball to distribute on every play, and already has three weapons with achievements great enough to demand a bigger share of the action. Ashland High School multi-year letterman at Sponsor Banquet ft:John Bolin, Marquise Jones,Adam Wolbert, Jake Wolfe, Greg Galloway, Connor Hopton, Spencer Cooper. In the back row from left are BACKCoach Valentine, Brandon Nardo, Steve Mowry, Josh Duewel, Zach Bernhard, Derek Ward, Steven Gill, Craig Krenzel. Craig Krenzel's message to the Ashland High School football players on Arrow Pride Night 2011 in Ashland University's Myers Convocation Center was simple. Enjoy yourself when you hit the field this fall and make sure you take time to stop and smell the grass you play on. Even if it's artificial turf, find some nearby green stuff and inhale the sweetness it has to offer. Krenzel said it will also help you get ready for what lies ahead. The quarterback who led Ohio State University to its first national championship in 34 years during the Buckeyes' 14-0 season, including a win over the Miami Hurricanes in the 2002 championship game in which he was named MVP, Krenzel was modest in his opening remarks. "It's an honor for me to be here," Krenzel said. "For what I've heard and seen just this evening, you all don't realize how good you have it. "I grew up about an hour north of Detroit and we had nothing like this. We did not have the community involvement and support behind a football team and program at the high school level but it's truly a blessing and an honor and I'm very humbled to be here." Arrow Pride Night was reinstated many years ago by Ashland dentist Dr. Bill Ihrig, bringing together local sponsors who mentor with the Arrow football players. It's that local support which Krenzel admired and said makes him get "jacked up" at this time of year. So much so, when he got done mowing the grass a few nights ago, his wife caught him cleaning off the mower and grabbing a clump of grass and smelling it. "When the weather cools off, that fescue, that bluegrass, it's got a different smell," Krenzel said. "It just smells like football and back in the good old days I use to walk into the 'Horseshoe' at OSU and pick up a handful of grass and smell it. I'd do it at every stadium we went to. "But there's just so many senses the game brings to me and the greatest thing I want to encourage you guys to look at the game and what it's going to teach you about life as a whole," he added. "I look back on my career and I've been so blessed, so fortunate. But when I look back at the game, it's so amazing how football will prepare you for anything and everything life has to throw at you." Krenzel said the first thing football taught him was how important it is to have a foundation. In almost his first three full seasons, he held a "nice cozy warm spot on the bench, which was frustrating and humbling." But he said when things are going bad, "It's the people, it's your beliefs, it's everything that picks you up. And, when things are going well, it's those same people and beliefs that will keep you humble and keep you grounded and keep you working hard and grinding to get better." Before Krenzel spoke, former AHS football player Noel Watson gave a tribute to legendary Arrow Roosevelt Robinson, who in most local circles is considered the best football player ever to don the orange and black, if not also the best-ever overall athlete, as he also played basketball and baseball. Robinson passed away July 7 at the age of 64. Watson noted how Robinson, 45 years after the fact, still holds four AHS football records, including rushing yards in a single season (1,963 in 1964); career rushing yards (4,085 from 1963-65); career touchdowns (56); and total career points (408). Arrow Pride Night emcee Ev DeVaul pointed out Robinson set those marks playing nine-game seasons. AHS head coach Scott Valentine introduced his coaching staff, thanked the sponsors for their commitment to the program and noted how through hard work, Krenzel persevered in his career. Krenzel earned his first start as QB for the Buckeyes in 2001 against the Michigan Wolverines in a 26-20 Ohio State triumph in Ann Arbor. It was the first win for OSU in Ann Arbor in 14 years. The grass likely smelled pretty sweet for the former Buckeye that season, and in the next, when he brought the national crown back to Columbus. 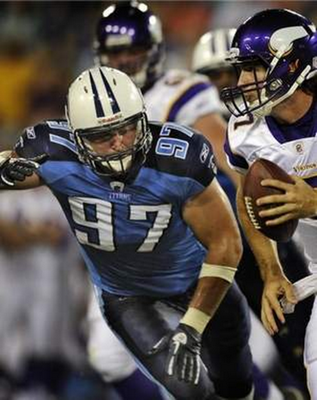 Titans rookie defensive tackle Karl Klug (97) chases Vikings quarterback Christian Ponder (7) out of the pocket. 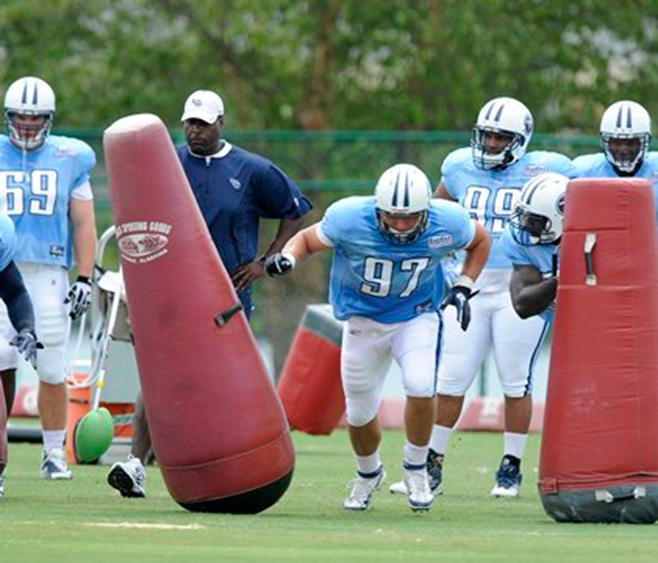 One point of emphasis for the Titans during the offseason was getting bigger and beefier on the interior of the defensive line. To wit: They signed 6-foot-2, 325-pound Shaun Smith, drafted a pair of 300-pounders in Jurrell Casey and Zach Clayton, and nodded in approval as veteran Jovan Haye bulked up to 312 pounds. So who’s been one of the biggest training-camp standouts so far? It’s rookie defensive tackle Karl Klug (pronounced KLOOG), a relative lightweight at 275 pounds. The fifth-round pick has earned a significant number of first-team reps and was a starter alongside Haye last Saturday in the preseason opener against the Vikings. Say this about Klug: He’s used to playing against bigger bodies. When he arrived at the University of Iowa, the Caledonia, Minn., native weighed all of 207 pounds. He gradually put on weight, but even as a junior he was going head-to-head with Big Ten linemen while checking in at 255 pounds. At Iowa, Klug played alongside two other NFL draft picks — first-rounder Adrian Clayborn and fourth-rounder Christian Ballard — and the Titans weren’t sure if his abilities would translate to the NFL. Coach Mike Munchak has been impressed with what he’s seen so far, however, and cited two examples of Klug’s best work against the Vikings. “You will be watching a play and think he is blocked, and then he is scrapping and the next thing you know he works down the line of scrimmage,” Munchak said. “The first play of the game, he is being double-teamed, the ball bounces to the outside and he is the guy that makes the tackle. Klug said he’s heard those words before, from Iowa coaches and Iowa offensive linemen. He figures his background as a high-school wrestler probably helps, giving him a feel for leverage and how to use opponents’ momentum against them. As for his frequent first-team appearances so far in camp, Klug said he’s just trying to keep everything in perspective. “It’s a good feeling to run with the ones, but right now it really doesn’t matter,” he said. Rams rookie tight end Lance Kendricks had an impressive debut for the Rams, catching a touchdown pass from Rams QB Sam Bradford. 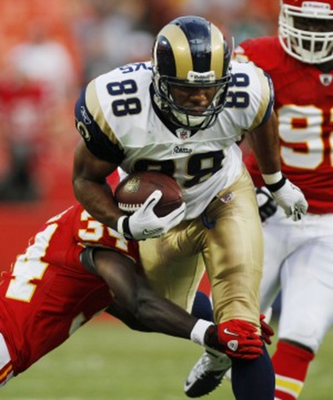 Many NFL experts and fans shook their head in confusion when the St. Louis Rams selected tight end Lance Kendricks out of Wisconsin in this past season's NFL Draft. The Rams already had a promising young tight end on the roster in Michael Hoomanawanui. But in the Rams impressive 33-10 trouncing of the Indianapolis Colts on Saturday night at the Edward Jones dome in St. Louis, Kendricks showed everyone why the Rams coveted him so much. Kendricks, making his NFL preseason debut, caught five passes for 47 yards, including a touchdown reception thrown by Rams standout quarterback Sam Bradford. Kendricks showed the ability to get open in the middle of the field, run with burst after the catch, and an the strength to overpower smaller defensive backs in the "Red Zone." Kendricks and Hoomanawanui figure to see plenty of time on the field together this season as offensive coordinator Josh McDaniels builds his offense around the tight ends, running back Steven Jackson, and of course Sam Bradford. Kendricks also figures to be an above average blocking tight end, considering he played his collegiate ball at run-first Wisconsin. 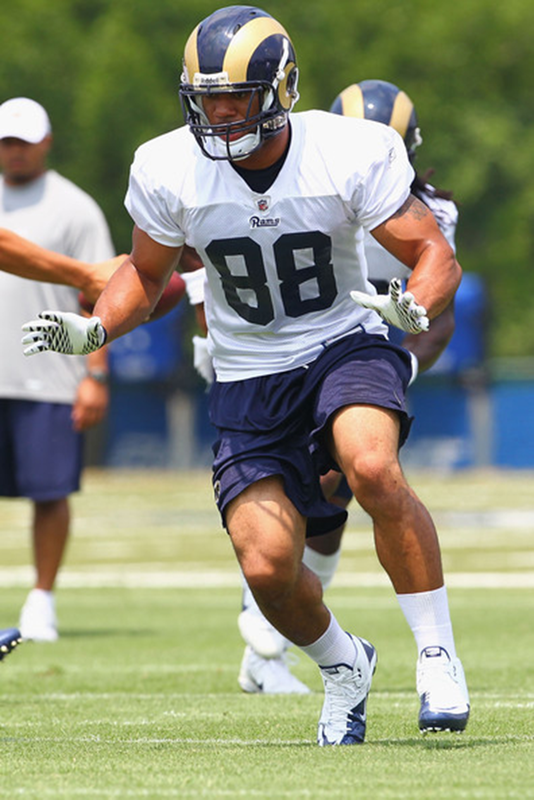 Kendricks certainly flashed some of his skills in his first NFL contest and Rams fans hope that drafting the tight end in the second round pays off in a big way for the Rams organization. The Rams have struck gold in the second round, acquiring Pro-Bowl-caliber talent in 2009 and 2010's drafts in James Laurinaitis and Rodger Saffold. They may have done it again with Lance Kendricks. 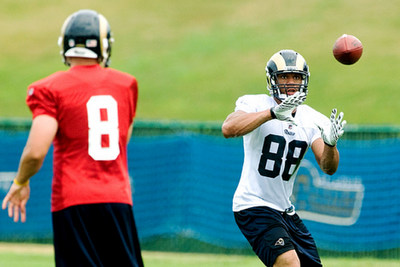 Now though, his positional versatility is becoming the talk of camp. Kendricks has lined up and carried the ball as an upback, blocked for the running game as both an H-back and a true tight end, lined up in the slot and split wide with equal verve. And his ability to shed blocks and get vertical in a hurry, combined with his soft hands, is drawing a lot of attention from camp attendees. Tight end Dallas Clark stretches before Colts practice at Macholtz Stadium during Colts Camp at Anderson University on Wednesday. Tight end coming back strong from wrist injury. ANDERSON, Ind. — Colts tight end Dallas Clark glanced at his left wrist, imagining the brace he wears during all contact drills at Anderson University. It’s a constant reminder of one of the worst moments of his nine-year NFL career. 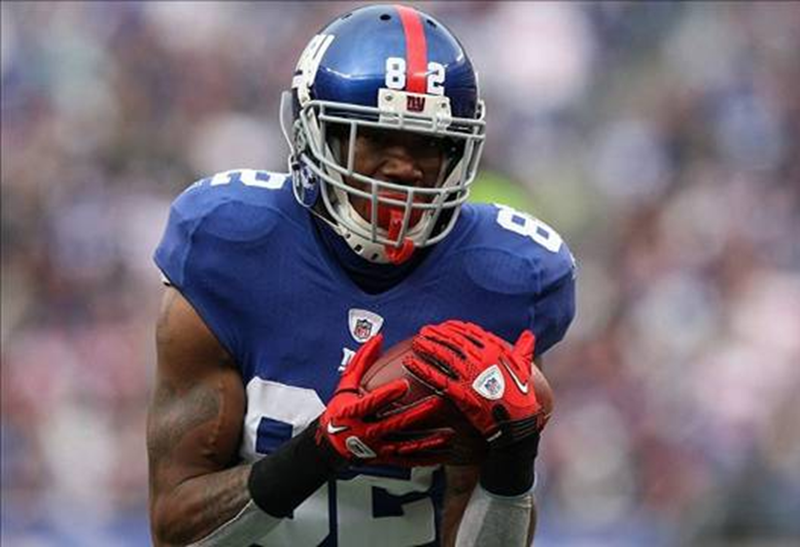 He suffered a freak injury on Oct. 17 last season against the Washington Redskins. Five days later, Indianapolis placed him on injured reserve — ending his season. Clark, who made the Pro Bowl for the first time a year earlier, had 37 catches for 347 yards and three touchdowns in just six games. Even Wednesday morning, some 10 months after the injury, pain was evident in his voice as he tried to put into words how it felt to watch from the sideline as his teammates made another playoff run. Clark isn’t wallowing in self-pity. He said he was inspired watching his teammates rally to win the AFC South championship and earn the conference’s No. 3 playoff seed. But it was tough watching the 17-16 loss against the New York Jets in the wild-card game and knowing he might have been able to make a difference. He’s even more proud of how his 2011 training camp has begun. All the pain associated with last year’s memories vanishes the moment Clark is asked about stepping back on the field for Saturday’s preseason opener at St. Louis. According to head coach Jim Caldwell, Clark enjoys the heck out of just about everything he does on a football field. It’s also been a highly successful approach. The next time Clark hauls in a touchdown pass from Peyton Manning during a regular season game, the duo will tie former New England Patriots Drew Bledsoe and Ben Coates for the most scoring passes (45) from a quarterback to a tight end in NFL history. Clark already owns Colts single-season records for receptions (100 in 2009), yards (1,106 in 2009) and touchdowns (11 in 2007) by a tight end. The previous owner of all three marks, John Mackey, has been enshrined in the Pro Football Hall of Fame since 1992. 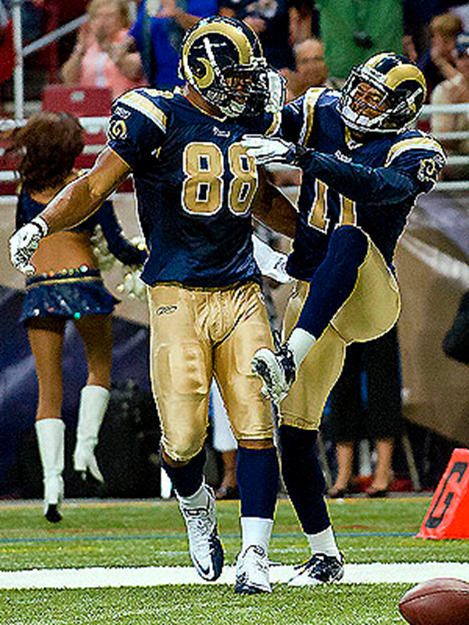 In his most recent healthy season, 2009, Clark caught 100 passes for 1,106 yards and 10 touchdowns. And the Colts advanced to the Super Bowl. So it’s worth noting when Clark says the brace on his wrist hasn’t slowed him down on the field at all. Doctors have said he’ll need to wear the brace all season. Clark isn’t as certain. As long as he continues to feel as good as he has so far at AU, Clark isn’t likely to complain about the brace or anything else. He’s back where he belongs. Aaron Kampman swears coaching, particularly in the NFL, isn’t in his future. “I won’t do that to my wife,” he said, laughing. A fairly large faction – numerically and physically – of his Jaguars teammates may see his point, but they still figure the veteran defensive end may be missing a calling. At the very least, football would be missing a pretty capable coach. 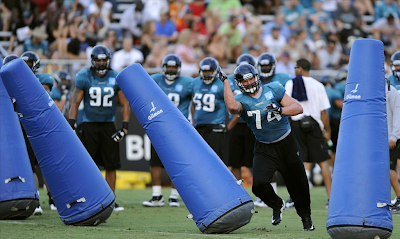 Want to know why Austen Lane has impressed fans, teammates and coaches throughout Jaguars 2011 Training Camp? Want to know why Tyson Alualu feels more prepared now than before? A variety of reasons, but the Jaguars’ defensive linemen will tell you at the top of the list was time spent with Kampman – the group’s veteran leader – in the off-season. Because of the off-season lockout, players were not permitted at the team’s facilities throughout most of March, April, May, June and July. No conditioning, no mini-camps and no organized team activities. No working with trainers, and no meetings with coaches, either. Players from teams throughout the NFL held various workouts, some of which were well-publicized and some of which weren’t. Jaguars players opted to have position groups work together much of the off-season, with a few team sessions at various times. Kampman led the defensive line group, and Jaguars Head Coach Jack Del Rio said the progress made was obvious. “We were trying to not just work on some of the traditional lifts and strengthening, but really developing the whole athlete in a couple of players,” Kampman said, adding that a big emphasis was on core-area training. Lane said the group focused on weight training, lateral movement and pass rush. “We were basically doing everything a defensive lineman is going to do to get ready for the season,” Lane said. But Lane and Alualu each said the logistics and details of the workouts would have meant little had Kampman not been in charge. Lane, one of the standout players early in camp, has impressed coaches with his speed off the line, body control and improved pass-rushing techniques. He said he doubts that would have been true without working with Kampman. Just how the off-season work will translate onto the field remains to be seen. For the Jaguars to improve, they must improve as a defense, and that means continuing to develop an effective, disruptive pass rush. Thus far in camp, Lane has impressed, as has Alualu, while Kampman – returning from a second knee surgery in as many seasons – has worked on both the right and left sides. Jeremy Mincey has also worked on both sides of the line, and Aaron Morgan is expected to be a factor. 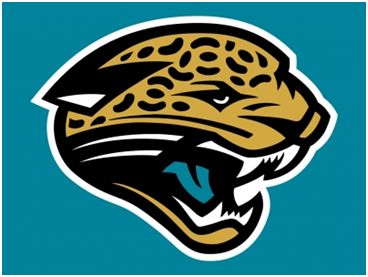 Terrence Knighton, considered a key to the Jaguars’ interior, reported to camp out of shape and has yet to practice, while defensive tackle D’Anthony Smith is returning after missing his entire rookie season with an Achilles injury. Continuing to improve, and finding a consistent pass rush from the group, will be key as preseason continues. To hear the members of the line tell it, their chances to make those improvements are better because of the leadership of a guy who may not want to coach, but is actually already doing so. You'd almost have to go back to Sept. 1, 1986, when coach Forrest Gregg purged quarterback Lynn Dickey and tight end Paul Coffman, to recall a day like Friday in the annals of the Green Bay Packers. 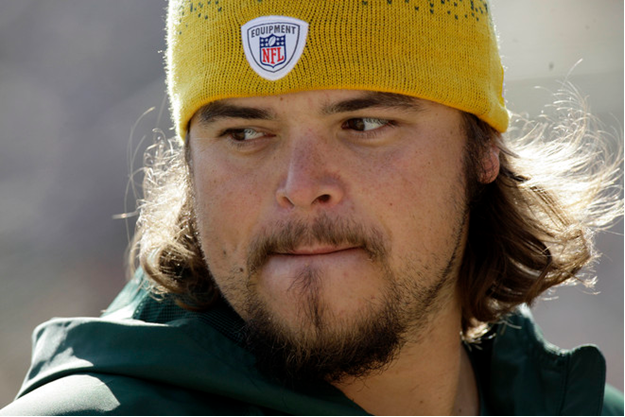 Among the big names terminated was Mark Tauscher. This isn't meant to be a full-blown analysis of Tauscher's career in Green Bay. This blog really isn't the vehicle for that. Instead, let's just recall Tauscher by some of the numbers by which offensive linemen are measured. To do so, it's inevitable that Tauscher has to be compared to Chad Clifton, his friend and fellow tackle. They were drafted together in 2000, they became starters together in 2000 and they were the team's starting tackles until the fourth game last season when Tauscher's season, and presumably career, ended with a torn rotator cuff against Detroit. We know how really good Clifton has been for a really long time. Finally, he was selected for the Pro Bowl in 2010 after having been an alternate twice before. Tauscher never made the Pro Bowl, and if he ever was chosen as an alternate the club never released it. Because of injury, Clifton has played more games than Tauscher. Counting playoffs, Clifton has played in 171 games, starting 166, whereas Tauscher played in 142 games, starting 140. Clifton's margin in starts of 26 is a significant number when you start examining raw totals in various categories, as we shall do. OK, let's start by looking at sacks allowed during each of their careers. If I've learned anything on this beat, it's that responsibility for sacks is what you think it is maybe 65% of the time. There are all kinds of variables that affect sack responsibility, and over the years I've done my level best to ascertain who truly was responsible for every sack allowed by the Packers. SACKS ALLOWED: Tauscher 20 1/2, Clifton 37. OK, let's move to "bad" runs. I started this in the late 1990s in an attempt to measure run blocking. I defined a "bad" run as a gain for 1 yard or less in non-goalline or non-short yardage situations. Why didn't I just say no gain or worse? Just an arbitrary decision. BAD RUNS: Tauscher 82, Clifton 106 1/2. OK, let's move to penalties. This total is for penalties that were accepted. Penalties that were declined or offsetting were not counted. PENALTIES: Tauscher 28, Clifton 77. The above three categories measure pass blocking, run blocking, poise and discipline. They do not consider that Clifton played LT and Tauscher played RT, and that by and large Clifton played against somewhat better opponents at RDE/ROLB than Tauscher did playing against LDE/LOLB. But considering how well Clifton has played and continues to play, seeing how those numbers favor Tauscher are rather startling. Clifton was blessed by better health. His one terrible injury was the separated pelvis that he suffered in Tampa Bay in 2002. Tauscher, on the other hand, suffered three: the torn ACL in New Orleans in 2002, the torn ACL in Houston in 2008 and the torn rotator cuff against Detroit in 2010. Each had other physical problems that kept them out of games. 2000: T3 behind Korey Stringer. 2001: 2nd behind Big Cat Williams. 2003: T1 with Mike Rosenthal. 2004: 2nd behind John Tait. 2006: 2nd behind Fred Miller. 2009: 3rd behind Phil Loadholt. 2010: Bryan Bulaga was the GB rep at RT. So, in nine seasons, Tauscher was first three times, second four times and third twice. He was never fourth or fifth. The point of all this should be rather obvious. 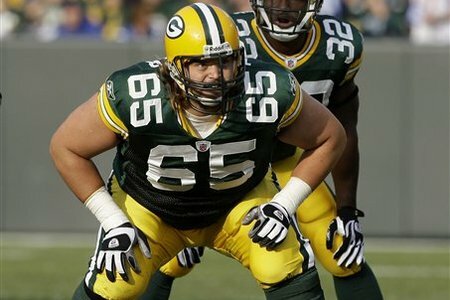 Tauscher was one hell of a football player. Over his 11 seasons, I must have talked to more than 100 scouts and assistant coaches about Tauscher's game. Some guys just could never get over the way he looked in a uniform. Over time, some almost grudingly came to admit that he was a solid player. It's true. Tauscher didn't look exactly cut on the field. But he possessed remarkable athletic ability, remarkable powers of concentration and remarkable intangibles that made him a worthy successor to Earl Dotson at the position and a proud predecessor for Bulaga. Tauscher was an acquired taste. One needed to see him play every game over a period of years to appreciate him. A four-game segment of a season or hurried off-season tape work wasn't enough. When the waiting period is up, Tauscher will have his induction night into the team's Hall of Fame. That will be well-deserved, of course, but it might be a little too slick for No. 65. Mark Tauscher doesn't need his name on a plaque or the Pro Bowl that now is skewed by fan voting to know what he accomplished. He just wanted to play the game well, and play it well he did.